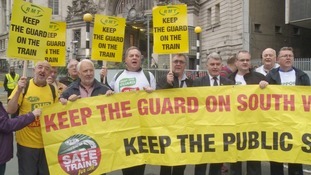 Train drivers are out on strike over the role of guards - with a bitter war of words being waged between both sides. Victoria station appears abandoned as railway strikes get underway. Yesterday Southern Rail failed to get an injunction which would prevent train drivers from walking out. Southern Rail advised commuters to find other means of transport despite the result of the injunction. A lack of service has caused frustration amongst workers. The Transport Secretary Chris Grayling said the strike was "futile", adding that he would have a "careful look" at how to deal with the situation when the dispute ends. He told the BBC Radio 4 Today programme that he was not ruling any options in or out. We are looking very carefully at how we take things forward. There are a lot of things to consider. Mr Grayling said he was not happy with the performance of the railways in general but he could not deal with the problems until the Southern strikes ended. He said he had asked Southern's owner, Govia Thameslink Railway, to attend fresh talks at the conciliation service Acas but Aslef had refused - a claim the union has denied. Hundreds of thousands of passengers face the worst rail disruption for a generation because of a strike by Southern Rail train drivers. The operator's owners lost a legal bid to halt the walkout which will mean days of disruption for hundreds of thousands of passengers. As a three-day strike by train guards on Southern Rail continues, ITV Meridian presenter Sangeeta Bhabra spoke to Alex Foulds, Deputy Chief Operating Officer Govia Thameslink. She began by asking him when the dispute was going to be resolved.